CLEVELAND, O.H. 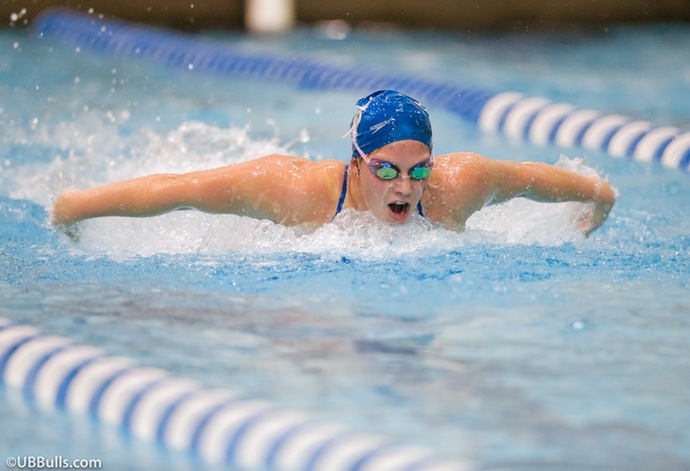 -- The University at Buffalo women's swimming & diving team wrapped up a successful first day of the Magnus Cup Invitational, hosted by Cleveland State University, on Friday as they currently sit in second place in a field of 16 teams. Sophomore Brittney Beetcher collected an individual victory on the day, with Buffalo collecting other victories in the 400 yard medley relay and 1-meter dive events. Brittney Beetcher collected the only Bulls individual victory in the swimming pool on the day, as she outswam all competition in the 200 yard IM event with a time of 2:04.46. The time was a career-best for Beetcher. UB would see victory claimed in another event on the day, this time in a relay event, the 400 yard medley relay. Collecting the win for the Bulls in the event was senior Maddy Jacumski, sophomore Jenna Krull, freshman Antonia Naccarella and Beetcher, as they clocked in a finishing time of 3:53.66. Junior Anna Vitolins and senior Sharne Tiller collected second place showings for the Bulls in their respective heats during the 50 yard breaststroke event, finishing with a time of 29.88 and 29.81 respectively. Sophomore Nicole Roitenburg swam to a second place finish in her heat in the 500 yard freestyle, clocking in a solid time of 5:00.33 during the long distance event. In the diving well, freshman Jae Sarkis impressed in her heat, collecting a score of 235.85 in the 1-meter dive event while freshman Patricia Arceri collected the victory in her 1-meter dive heat with a score of 233.75, earning her first collegiate victory. The Bulls currently sit in second place with a team score of 358, only behind MAC foe Akron, whom the Bulls competed fiercely with just two weeks ago in their season-opening meet. Akron currently have 529 points as a team. "Today was a good day for us", said Bulls head coach, Andy Bashor. "I am proud of how we are competing, we are looking forward to tomorrow and seeing what we can do." The Bulls return to the pool today at 9 a.m. for day two of competition in the Busbey Natatorium.